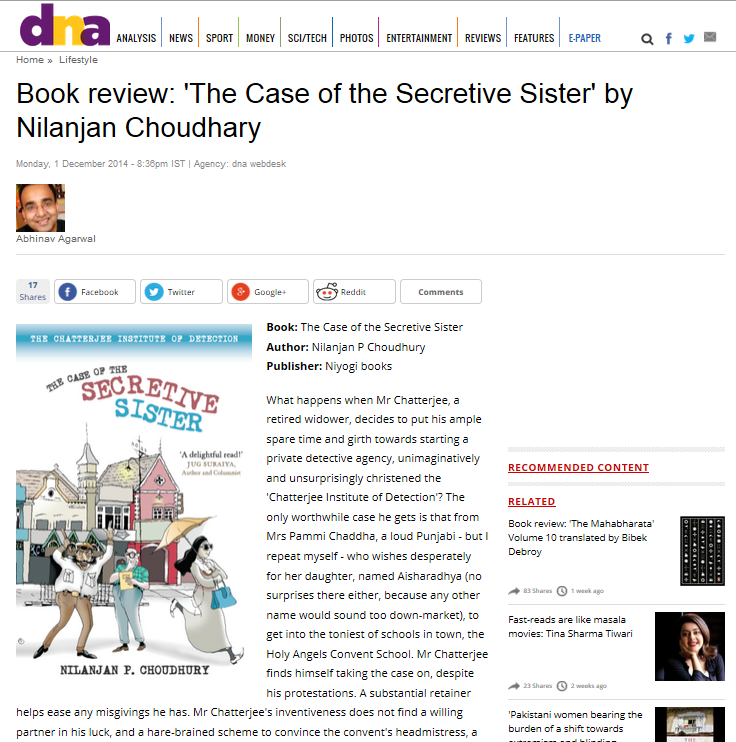 My review of Nilanjan Choudhary's latest book, "The Case of the Secretive Sister", was published in DNA India on December 1, 2014. I would whole-heartedly recommend the book! What happens when Mr. Chatterjee, a retired widower, decides to put his ample spare time and girth towards starting a private detective agency, unimaginatively and unsurprisingly christened the "Chatterjee Institute of Detection"? The only worthwhile case he gets is that from Mrs. Pammi Chaddha, a loud Punjabi - but I repeat myself - who wishes desperately for her daughter, named Aisharadhya (no surprises there either, because any other name would sound too down-market), to get into the toniest of schools in town, the Holy Angels Convent School. Mr. Chatterjee finds himself taking the case on, despite his protestations. A substantial retainer helps ease any misgivings he has. Mr Chatterjee's inventiveness does not find a willing partner in his luck, and a hare-brained scheme to convince the convent's headmistress, a stern Ms. D'Souza, to grant admission to Pinky (the home name of Aisharadhya) sees our budding detective losing his shirt - literally, and on the run from a determined Inspector Gowda. Does he get his shirt back, does Pinky get admission, and does Inspector Gowda get the satisfaction of laying his hands on Mr Chatterjee's throat and more? What secret does Sister D'Souza have that could come to Mr Chatterjee's rescue? Could he blackmail her? Or will Inspector Gowda get his sweet revenge before Mr Chatterjee his shirt? This short book by Nilanjan Choudhary is a very different tale from his debut novel, the wickedly irreverent "Bali and the Ocean of Milk". Glimpses of Nilanjan's play with words are visible throughout the book, as is his talent of making characters come alive through their words, albeit sometimes in cliched shades. One can imagine Nilanjan grinning away while typing away Mrs. Pammi Chaddha's lines, giving her a vocabulary and excessive use of the definite pronoun that would make even a notable Bollywood producer blush. Mr. Chatterjee's escapades, and escape, from the school has that delicious mix of the slapstick and near believability that can tickle the ribs. However, there are a few peeves also. First, this book is short, it took some 40 pages for the meat of the plot to kick in. For a book 160 pages long, I think the preamble was a little too long. But most importantly, for me at least, this book could have been very easily aimed at children and young adult readers. And for the most part the book is completely suitable for that audience. Its length, plot, and narrative is all geared towards that. However, a most unexpected burst of profanity from one character in the book, that seems gratuitous, mars any chances of doing that. In some ways, I am reminded of Amruta Patil's gorgeous book, "Parva", that has a few pages of illustrations that would make me think twice before handing it over to a young reader. The same is the case with Nilanjan's book - if he would only rewrite those few lines, I could hand the book over to a tween without hesitation. Something he could consider perhaps for the second installment of Mr Chatterjee's escapades? From the looks of it, this is the first in a series. Therefore, even though Ms Jolly - Mr Chatterjee's anything-but-jolly assistant and Manjunath have only brief cameos in this book, I expect they will have more substantial roles in subsequent stories. I would certainly recommend this book. It's a short, fun, and none too taxing on the mind either. I would also strongly urge readers to read Nilanjan's first book - "Bali and the Ocean of Milk". Among the burgeoning mass of mythological fiction flooding the Indian market, that's still an outstanding work. The Case of the Secretive Sister is an encouraging start in its genre, and here's hoping Mr Chatterjee does not lose his shirt on his next case. Disclaimer: the views expressed are personal. Nilanjan, the author, kindly had a copy of the book sent to me, courtesy the publisher..